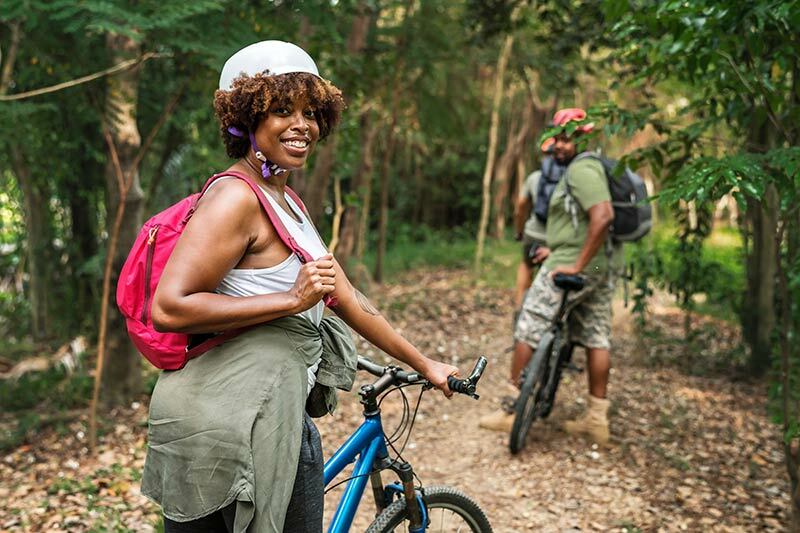 Located in a wooded buffer zone, Alexander Mountain Bike Park offers about 7 miles of trails on a slope high above the French Broad River. The trails range from smooth and fast (less common) to tight and twisty (more common), but in general they are rated Difficult and are moderate in aerobic and technical challenge. The red-blazed right loop starts at the parking area and travels around the lower section of the park, totaling just over 3 miles and containing the more track. The yellow-blazed M3 Loop starts at the tip of the right loop (at an access road) and winds around the hillside above the French Broad River. It has a faster, more flowing feel to it. Notice: The barn road connects the parking area to the right loop and then continues uphill to form a connection through the middle of it.